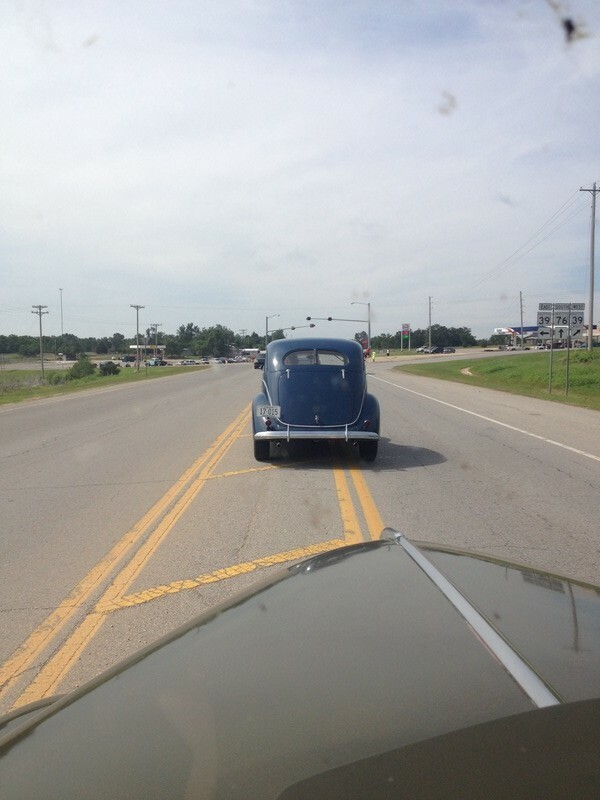 A shot of Clay Vance’s ’37, while we were on the Oklahoma City Hot Rod Hundred! With all the running and gunning over the past couple of weekends, with the HAMB Drags and Frog Follies, I figured it would be a real good decision to stay close to home this past weekend. Other than swapping parking spaces in the garage, and getting the stake truck in the “go” spot, not a whole lot done here. The Stake truck got parked in the back of the garage, after coming home from St Louis back in July. For some reason, I think to punish me for not driving it, it’s carburetor started acting up, after it sat for a while. I took the carb off, on Wednesday, and gave it a good cleaning, and the truck ran great. The next day, it started hesitating on acceleration again. I may have to rebuild the other 94 that I have sitting around, and see how it does. In the meantime, the pre-registration date for the St Louis Area Hot Rod Hundred was coming to a close. The actual event date is October 11, but we were wanting to get our participant list filled up and get T-shirts ordered in plenty of time. My phone and e-mail have been going crazy! I have a different excitement about the St Louis event, than I did with the Springfield Hot Rod Hundred. The Springfield event was an overwhelming success, albeit more of an “open” event, up to vehicles that were pre-73. The St Louis run is predominantly pre-49 hot rods, and a good portion of the participants are my “hot rod mentors”! It’s an opportunity for me to show them that I have been a good student of the hot rod tradition. I don’t want to make the events sound like they are “StreetRodder.Net” events, as they are not. I’m a supporting club member of the CrossMembers Car Club, which is the club putting on the Hot Rod Hundred events. So far, we’ve done Phoenix, AZ, Springfield, MO, Oklahoma City, OK, and Dallas, TX. St Louis will be the final one for 2014. If you want to join in on the fun, please go to the Hot Rod Hundred web site, download your form and send it to me, with your entry fee, and we’ll get ya on the spreadsheet. The next Springfield Hot Rod Hundred will be April 4, 2015. In the next month or two, I will be doing another “Route Scout”, and am always open for folks to run along, so I can get some feedback.